Their petition lays bare the problem. State Supreme Court hasn’t responded. As money in elections becomes more predominant, citizens rightfully ask whether justice is for sale. The appearance of partiality that large campaign donations cause strikes at the heart of the judicial function, which depends on the public’s respect for its judgments. In this age of Super PACs and other independent campaign organizations, perhaps the influx of money to purchase access to legislators has numbed us to ethics. But we are not the legislature, we are the judiciary. The retired judges make three requests. The first asks the Supreme Court to put limits on the amount that a party to a lawsuit can spend on a judge’s election without triggering an expectation of recusal. These proposed limits are $10,000 for a Supreme Court Justice, $2,500 for an Appeals Court Judge, $1,000 for a Circuit Court Judge, and $500 for a Municipal Judge. 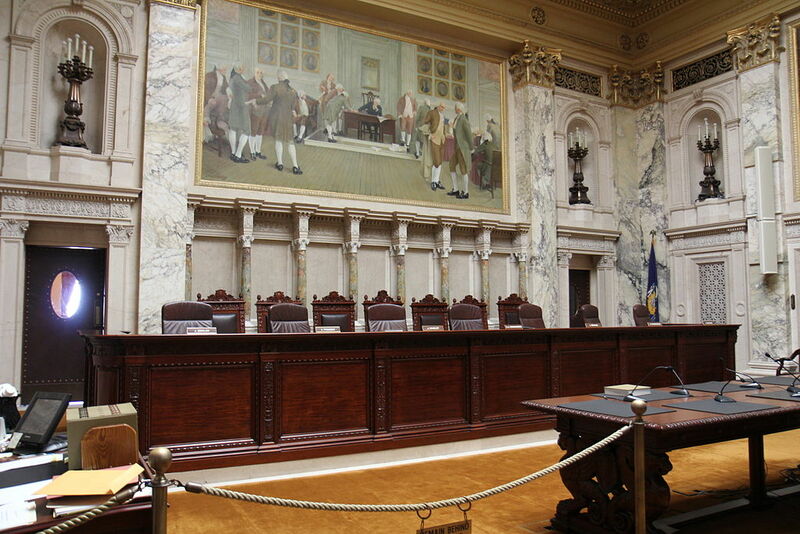 Next, they ask the justices to join them in proposing an amendment to the Wisconsin Constitution granting the Supreme Court authority to appoint Appeals Court judges or retired Supreme Court justices to temporarily fill in when necessary to reach a quorum. This change would remove one of the arguments against recusal, that when several justices have a conflict, those remaining might not constitute a quorum. It also would put Wisconsin Supreme Court practice closer to that of appeals courts in Wisconsin and the US, which often fill out panels with circuit court judges or retired judges. A bit of background is necessary. In 2009, a majority of the Justices–Patience Roggensack, David Prosser, Annette K. Ziegler and Michael Gableman—rejected a proposal from Justice N. Patrick Crooks to require recusal if a justice had received substantial election support from one of the parties in a case. Voting for the rule were Justices Crooks, Shirley Abrahamson, and Ann Walsh Bradley. The following year, the same majority of four justices adopted a proposal taking the opposite position, written by Wisconsin Manufacturers and Commerce and the Wisconsin Realtors Association. This vote showed the same 4 to 3 split as before, but in the opposite direction: the justices who rejected the Crooks proposal voted for the WMC proposal; those supporting Crooks voted against. A judge shall not be required to recuse himself or herself in a proceeding based solely on any endorsement or the judge’s campaign committee’s receipt of a lawful campaign contribution, including a campaign contribution from an individual or entity involved in the proceeding. When a justice of the supreme court withdraws from a case, however, the justice is not replaced. Thus, the recusal of a supreme court justice alters the number of justices reviewing a case as well as the composition of the court. … neither a judge nor the judge’s campaign committee has any control of an independent expenditure or issue advocacy communication because these expenditures or communications must be completely independent of the judge’s campaign, as required by law, to retain their First Amendment protection. That since the existing rule was passed, the legislature increased the limits on judicial campaign contributions by a factor of 20. That in the John Doe case the Supreme Court overturned the above-mentioned ban on coordination between “independent” groups and campaigns so long as there was no explicit call to vote for or against a particular candidate. That the success of a vote to change the method of selecting the chief justice in the state constitution suggests a change to allow a retired supreme court justice or appeals court judge to replace justices who recuse themselves could also be successful. That a survey of recusal rules for states that elect judges rated Wisconsin as fourth from the bottom. However, a readily available limiting construction exists that we will apply and that will prevent the chilling of otherwise protected speech; namely, that “political purposes” is limited to express advocacy and its functional equivalent. Yet the “special prosecutor’s legal theory” is precisely the requirement that the same four justices described as “required by law” in 2010 when justifying their refusal to set limits that would require recusal. They specifically mention “issue advocacy“ as part of the independent expenditures that cannot be coordinated. The willingness of the four justices to switch their position on the allowability of coordination between so-called independent groups and candidates betrays an unseemly desire to reinterpret the constitution to achieve a predetermined result. The retired judges’ petition raised the usual objections from the usual suspects. The Journal Sentinel article gives some of these some of these, notably that it would chill constitutionally protected speech. If you’re Wisconsin Right to Life or the NAACP and you want to be heard during a Supreme Court race (and) the penalty for your participating is that some of the people who think like you can’t hear the case, that’s a burden. This view confuses judges with legislators who can legitimately make promises to vote a certain way. It is odd to see conservatives embracing the concept of activist judges, judges with a policy agenda. We seem to be fast losing the ideal of the thoughtful and open minded judge who avoids pre-judging a case. The danger of this approach can be seen in the Wisconsin Supreme Court’s John Doe decision, where the court majority was willing to leave the impression that justice in Wisconsin was for sale with the right campaign contribution. Justices, of all people, should be eager to protect the reputation of the judiciary. The danger of politicizing the courts can be seen in the right-wing Wisconsin Watchdog’s take on the petition from the retired judges. As is his wont, M.D. Kittle’s argument is that the petition is just another liberal plot against the free speech rights of conservatives. In Kittle’s view, anyone concerned about government corruption or judicial integrity must be part of this plot. Another argument is that the retired judges’ proposal would lead to strategic donations, in which a donation is made to an unfriendly judge with the aim of forcing recusal. However, this strategy would be easy to counter, for instance, by allowing the non-donating party to waive its right to ask for a recusal. Underlying the retired judges’ proposal is the recognition that allowing a judge to sit on a case when that judge has personally benefited from the actions of one of the parties in the case undermines the expectation of impartial justice. If, by undermining the ability of contributors to benefit from their contribution, the proposal had the effect of reducing the enormous spending on Wisconsin Supreme Court races, Wisconsin would be a better place. Yet Chief Justice Roggensack has so far offered no response — not a word — to the proposed reform.